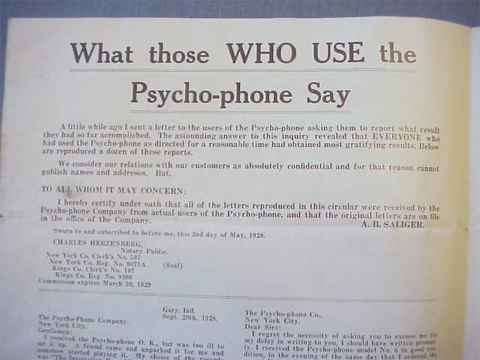 We would like to thank PBS History Detectives for their research on the Psycho-phone device. We are also happy to announce their results match ours. This research is provided by Bonnie Vent. Here is some more details from our research. 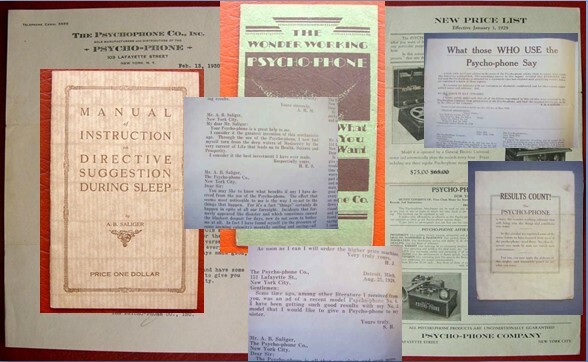 The Psychophone Co., Inc. was located at 151 Lafayette St. in 1928 and 103 Lafayette St. New York, NY in 1930. 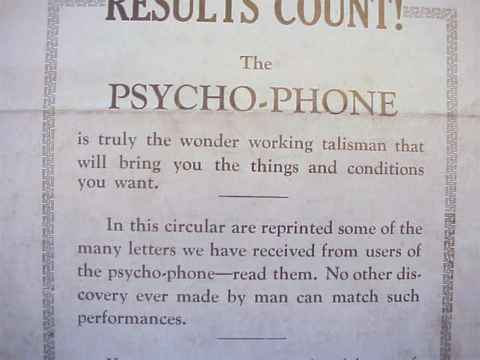 The inventor of this particular psycho-phone was AB Saliger who was also the owner of the Psychophone Co., Inc. 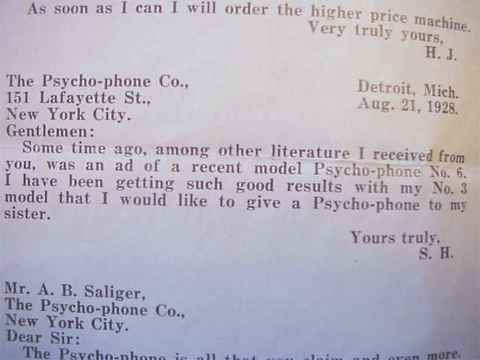 The patent was issued in 1927, testimonials were received in 1928 and we know that AB Saliger was offering stock to existing owners of the psycho-phone in 1930. See below of more details. 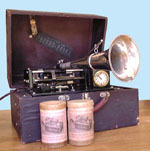 Front views of the Psycho-phone that was for sale by a collector is 2002. 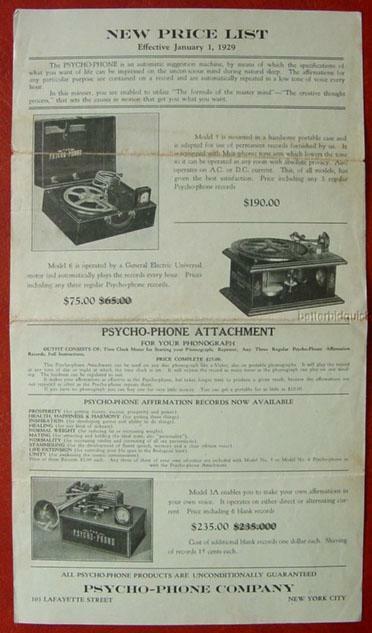 This is a scan of an original manual on using the psycho-phone device. 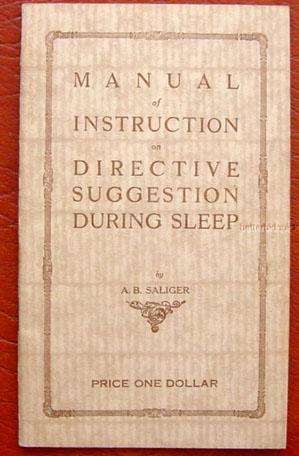 Written by AB Saliger. 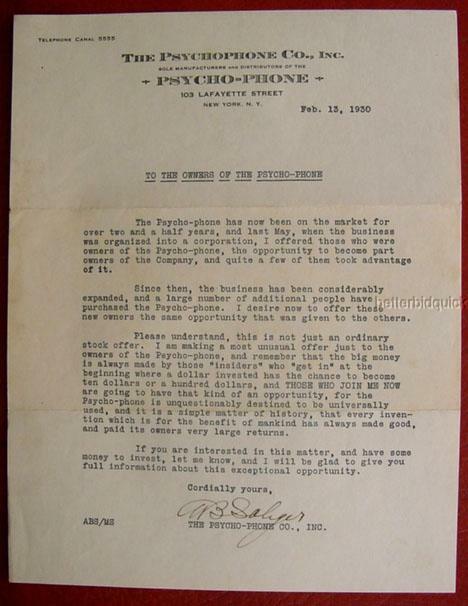 This letter from AB Saliger of the Psychophone Company., Inc. dated February 13, 1930 offers existing owners of a psycho-phone device a stake in his company. 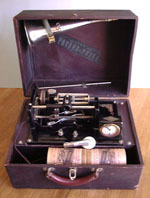 You will notice that sometime between January 1, 1929 and February 13, 1930 the company was incorporated and the address changed. See price list vs this document. 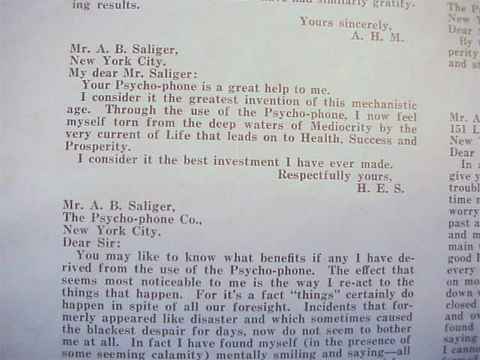 Here are copies of actual testimonials of those who used the psycho-phone and wrote of their experiences to AB Saliger of the Psycho-phone company of New York. 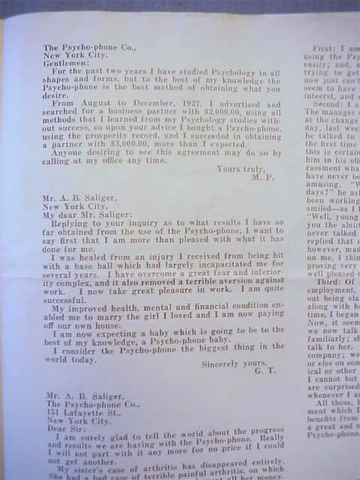 One testimonial is dated August 21, 1928.